It’s been raining non stop for days now and for the first time ever I was very brave and ventured out into the cold for some outfit pictures. Anyone who knows me in “real life” would tell you that I don’t deal with the rain very well; even the smallest amount of rain makes me worry about my hair texture or my shoes and clothes getting wet so this was a big deal for me. I felt like a very dedicated blogger; it was absolutely freezing taking photos. I’m not too sure if it will be happening again. I have no idea how those of you living in locations much colder than Australia, manage to do it! At least these pictures capture the true nature of winter; it’s not always bright, warm and sunny here! It also gave me the chance to show you my new coat from Review, my new scarf and my lovely heart umbrella which never makes an appearance. I won this Topshop scarf from a giveaway on Hamida’s blog which is called Loosely Tied to Fashion. I was so excited to win and very happy that it is so beautiful and totally my style. The design is so sweet and gorgeous. It is officially my favourite scarf I’ve ever owned. I also noticed that it’s much warmer than the scarves they sell in Australia which is very helpful especially since I’ll start getting up early in the cold for work soon. So much of my thinking revolves around the prospect of work at the moment. Even though I shouldn’t be spending too much money on clothes right now I’ve bought a few warm winter clothes and pieces for work which I will show you later. I thought this coat would be great for traveling to and from the big city for work especially given that it’s longer than any of my other coats. It was also a bargain! It’s from the current sale at Review and there was only one left which was luckily in my size. Don’t you just love it when that happens? By the time this coat had been discounted a number of times, in combination with me being a Review member, it ended up being 70% off the original retail price. Just like the one which I posted here, I’ve found some great deals when it comes to coats. I love the bright pink, especially the way it stands out in the winter. I also adore the buttons and the peter pan style collar (which is difficult to see while wearing a scarf). This entry was posted in Alannah Hill, Outfits, Portmans, Review Australia. Bookmark the permalink. 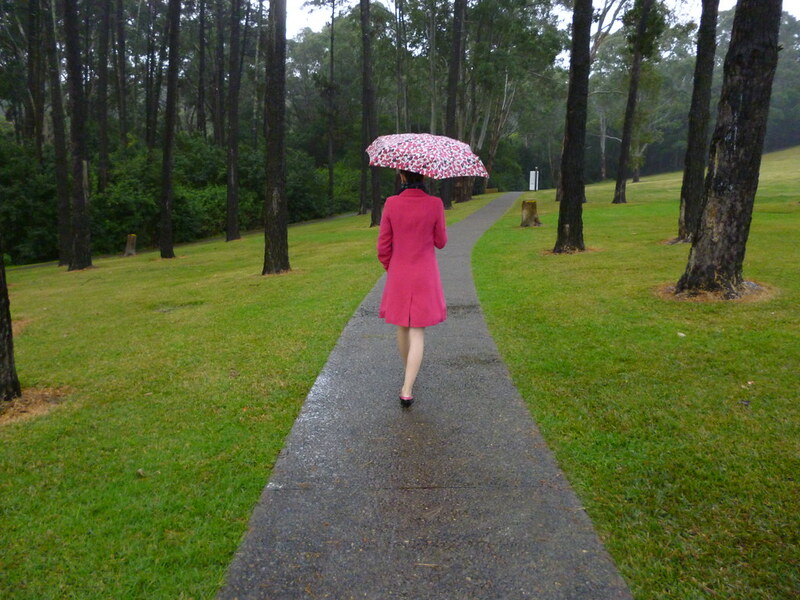 The pink coat is looking romantic on a raining day! the brighten color look fab on a raining day as well. love it! Totally love the jacket! The color and style, its just perfect!!! Beautiful outfit and you look great in it. If you or anyone you know are interested in earning income just for gathering referrals check out my page. The rain stinks…but you look super cute…love that pink coat! You really have an amazing Blog an i love your Style. What a gorgeous, well put together outfit! I really love this! thanks for stopping by! yeah the sale was really good but it was only on for 4 days. maybe there will be a similar one 🙂 anyways great coat! the colour suits you! This bright pink color you are wearing is soooo pretty and goes so well with your cute umbrella. I love how you wore bright colors on a grey rainy day! Loving the bright vibrant colours. You are so gorgeous and your coat so absolutely stunning! Love the bright pink! So cute, as if taken from a fairytale. Love the umbrella. You are so cute! Love the pink coat! Oh my! The bold color of your coat is amazing! You glow in pink dear. The tiny pop of the same color from your feet and ear adds beauty on this whole outfit! Great look hun! Rain makes you more beautiful!! Sooo pretty, the pink coat is great ! Amazing place….love your scarf online…..